This past Friday the Dad’s club at Zach’s elementary hosted a Dad’s camp out on the school grounds. Now, let me ask you – what do you think that means? Well, apparently I am the only one who understood that it means the dads and kids camp out in a tent on the playground. My mother in law thought they would be “camping” inside. My friend Mary asked if they were staying all night – I gave her the crazy eye and said, “of course” and Alex combined them both and kept asking what they would be doing, where they would be sleeping AND if they would be staying all night. I repeat, it is a CAMP OUT. How am I the only one who gets this? Please keep in mind I don’t camp. At all. Aside from my long run at Camp Cho-Yeh summer camp I don’t like sleeping outside. I asked Alex if he would be purchasing a tent and he said they could use the one that my mom bought for Zach at the River and sent home with us recently. While it is an actual tent, it is about 4 x4. Alex is 6.1, just for your information. Here is a model of what the row of tents looked like with our mini-one included. No joke. It was hilarious. Alex tried to sleep diagonally and ended up having to sleep with his feet out the door. Hilarious. 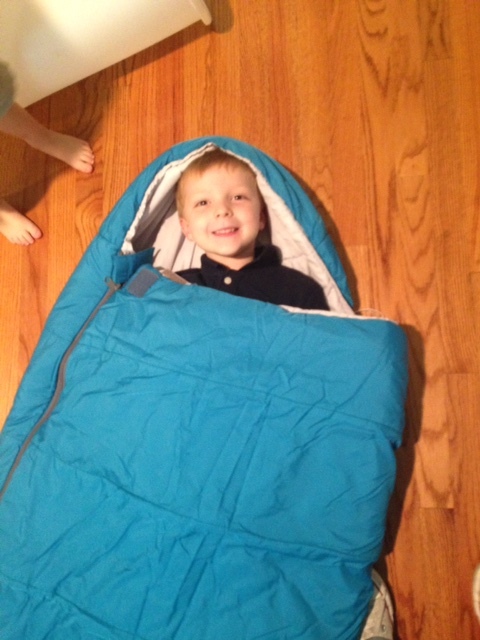 He also promptly lost Zach’s sleeping bag, so they had to open up the cone shaped one I stole from my friend Kate back in 2011 and use a blanket on top. I am hoping to find Zach’s in the lost and found as technically it is Liv’s and she is not going to be pleased to hear about this. Apparently the entire night is one big free for all. The dads sit around and talk and the kids run wild. Alex said he went inside during the movie time to find Zach and the twins riding a chair down the ramp from the stage. Zach assured him it was totally safe and totally fine. I think they finally went to sleep around eleven. Oh, it also rained a bit and Alex had some how put the cover for the tent under the tent so they had to use the sleeping bag cover as a rain shield. I am not making any of this up. As you can imagine, James was not pleased to be left out of these shenanigans. I had to bribe him with a trip to Chick-fil-a, the cupcake store AND with a viewing of Frozen. We scooped up Mary (she forgave me for the crazy eye) and her little girl and had a relaxing night, only being in charge of two children. James and I finished off our night with a trip to Randall’s for soft dog food for Norm. He got his teeth cleaned and apparently needed softer food. I let James ride the Ernie and Bert fire truck because I was feeling generous. And he looks so cute on it. Can you tell how tired he is? 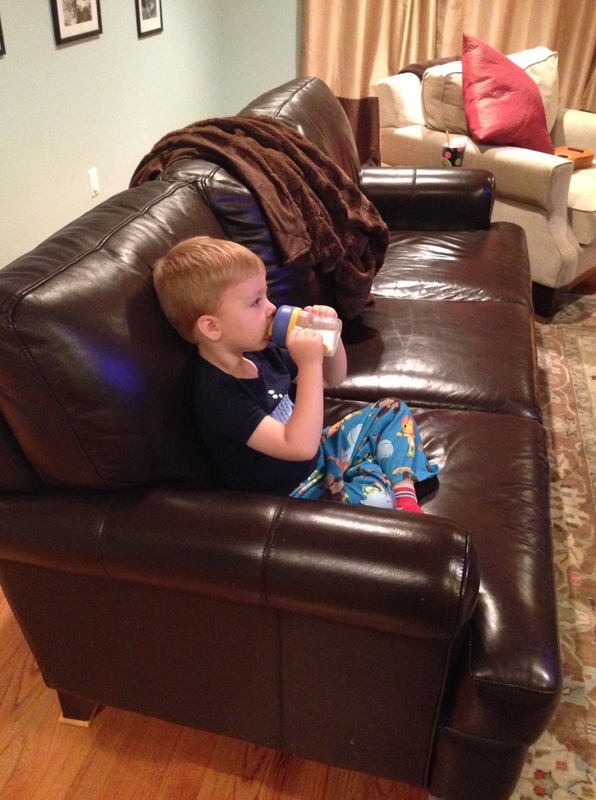 Drinking his “hot milk from his baby cup”? Don’t even start – I know he is waaaay too old for me to be heating up his milk AND for that cup. I don’t have the energy to care. Anyway, everyone had fun. Alex and Zach were exhausted the next morning from the no sleeping in a little tent plus the 8:30 a.m. soccer game. But it was the most quiet afternoon ever in the Wall house. Both Alex and James took a nap and Zach and I laid on our respective couches and watch TV. Delightful. 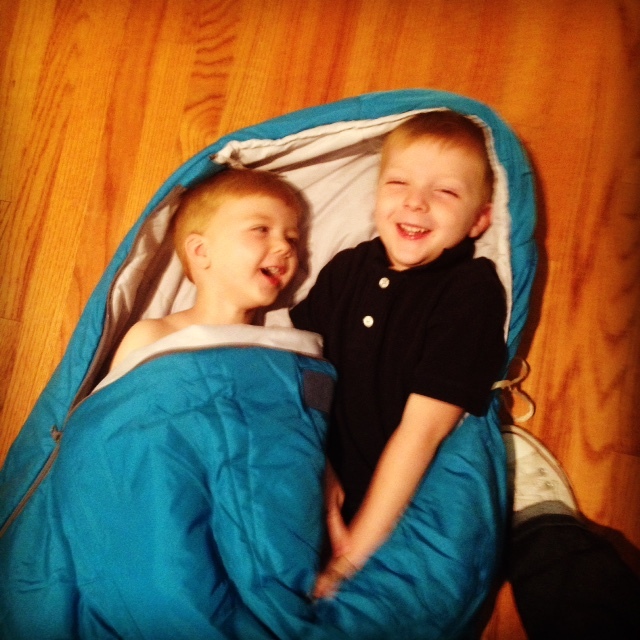 I personally am looking forward to two years down the road when Alex will have both boys with him at the camp out. Hopefully in a bigger tent.